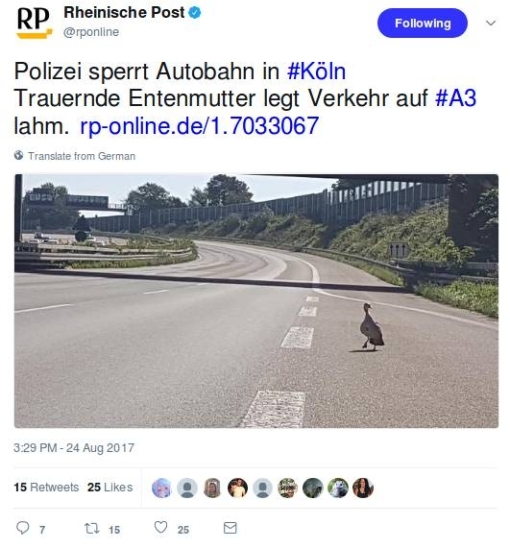 “Grieving Momma-Duck Paralyzes Traffic on the A3 Autobahn” – it’s quite a story, a tragedy, really, reported by the Rheinische Post from news-agency dispatches. As we humans know, you actually never try to walk across the Autobahn in Germany, not unless we’re talking about a pedestrian overpass. But this momma-duck didn’t know anything about that, and apparently led her brand-new brood of ducklings onto Autobahn 3, at the spot just to the west of Cologne where it crosses Autobahn 4 coming from the west. That brood numbered a bit more than five ducklings. We know at least “five” because, unfortunately, that was how many smashed duckling bodies were left there on the pavement, before the momma-duck and the rest of the ducklings managed to get off the highway quick and into the surrounding foliage. The problem was that the momma-duck then reappeared at the same spot around three hours later, presumably trying to find out what had happened to her missing progeny. She was harder to drive away this time; for whatever reason, there were firefighters on the scene, but she wouldn’t let herself be caught nor be shooed away from the Autobahn – where, we can assume, the on-coming high-speed traffic was staring to make things dangerous. Now, this happened during the day last Wednesday, so a business day but with perhaps traffic a little less thick than usual because for many it was the tail-end of summer vacation. But the traffic was undoubtedly still substantial – this is Autobahn 3, people, the Autobahn coming out of Cologne and paralleling the Rhine southward for a while before heading eastwards to Frankfurt am Main, and beyond. I have never heard of the Dutch authorities ever shutting down a highway due to any bird. Then again, in a couple of places there highways do have “animal” overpasses, that is, bridges built over the highway from the woods on one side to the woods on the other, for wildlife to use. These are expensive, of course, and perhaps one could argue about their actual benefits to the public versus their costs; but then again, perhaps Germany could take up this idea and add a couple of these to its infrastructure budget nonetheless. Sorry, no sort of “public service announcements” are going to be able to educate the ducks! Perhaps it is untoward to quote oneself, but in this case my tweet of a few days ago has to be revised and extended in light of further information. In particular, I put there “after complaints,” but in that I was just being faithful to the original article out of De Volkskrant, a Dutch newspaper. Aldi received at the beginning of last week the first complaints. One customer asked them not to use anymore the mosque, a religious symbol, on the label. Then a discussion arose on the Internet, after which Aldi pulled the soap from the shelves. According to this, it wasn’t “complaints”; it was one complaint about that mosque on the soap-label, from one guy on Facebook. This is backed up by this report from the local newspaper from the area where this Aldi store is located (North Rhine-Westphalia). That was all that it took: off of the shelves those bottles of liquid soap flew! 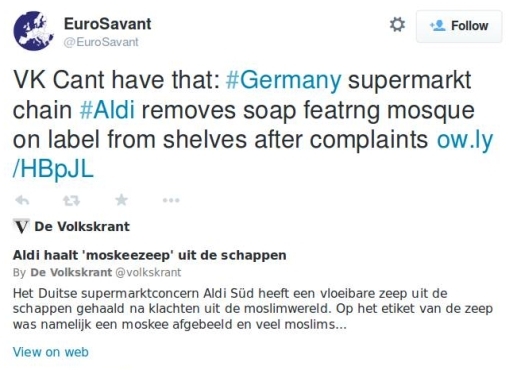 But in that last tweet you’ll perhaps have notice a recent addition to German public vocabulary: “shitstorm.” That is what ensued: Aldi promptly came under fire for its action (although I’m unaware that that has caused them to reverse it and start selling the soap with those labels again). 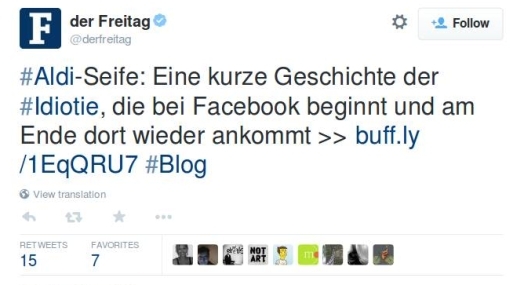 A heads-up for whoever is going to be in Cologne tomorrow, things could get interesting. “Cologne visit by Turkish PM: Merkel calls for restraint from Erdogan.” Now, this is no sort of state visit, neither Merkel nor Gauck will be anywhere near him, but rather the sort of sojourn Erdogan likes to make from time to time to go shore up his support among the many citizens of Turkish nationality living in Germany. 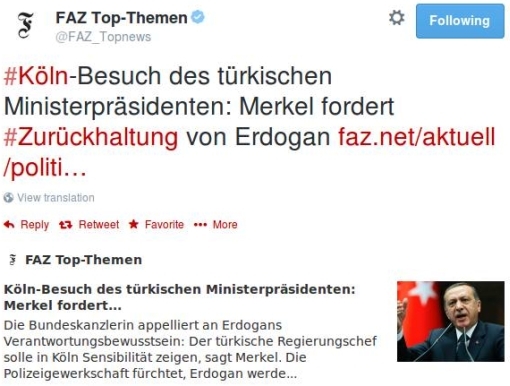 “Turkey fears a trap for Erdogan in Cologne.” But why? Because the German authorities also approved no less than eight counter-demonstrations in the city on the same day. No wonder the Turks are suspicious: they would simply forbid any such counter-demonstrations, and no doubt were ready to do so during President Gauck’s visit there last month – if anyone had actually applied to hold any. 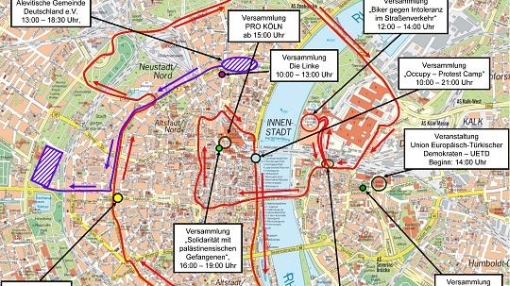 Cologne streets could turn into quite a scrum on Saturday, but the latter Rheinische Post article at least has published the following almost military-looking map to help you make your way. FYI, the stadium-event where Erdogan will actually be speaking is the one the furthest to the right that says Veranstaltung UETD. A coming high point in European Union affairs is the elections to the European Parliament scheduled for the period 22-25 May, which will be for all 751 seats. They were made more exciting (if you find them exciting at all in the first place) by an extraordinary intervention a few weeks ago by the German Federal Constitutional Court, which struck down the 3% threshold that had been required of individual political parties for gaining representation in the European Parliament at all. Nonetheless, five of the judges on that German Federal Court (out of eight) concluded that there was no more need for any such electoral threshold to “preserve the European Parliament’s ability to function.” Fine, then, but the legislatures of a handful of other EU member-states do still retain this sort of electoral threshold – in particular, Germany itself, with a 5% hurdle to gain representation in the Bundestag! Yes, it’s Die Linke, or “The Left” which is the German political party now calling on that domestic electoral hurdle to be abolished. That’s the party representing the left-over of the old SED, i.e. the “unity” party which dominated the former German “Democratic” Republic (East Germany) in a far from democratic manner. Let’s remember why that 5% barrier was inserted into Germany’s post-WWII federal constitution in the first place: because the constitution of the Weimar Republic before Hitler did not have any such rule, and it was the proliferation of pissant political parties in the Reichstag that made the State almost ungovernable and paved the way to power for the Nazis. The German President, Joachim Gauck, however, has indicated a willingness to see a debate on the point. What’s more, maybe “predictability” is not necessarily the characteristic you would most want to associate with any legislative body that is supposed to be accountable to the people through elections. At bottom, though, we are left with a simple logical inconsistency. Could those five federal justices voting to abolish the EP’s 3% electoral hurdle please explain why that same calculus should not also apply to the Bundestag’s 5% hurdle? One suspects that the only answer they would be able to come up with is that the European Parliament is so much less important – has so much less real power – than the Bundestag that it is quite alright to maintain the former as a convenient hobby-horse for all of one’s best, and most idealistic, democratic intentions. “What the laughter of animals really means,” it says there. The smiles, too – like what we always see on dolphins, for example, and if you click through to the Rheinische Post article you are rewarded right there at the top with one smiling right at you and his (?) buddy not far behind. What about Fido – you know that he laughs, you’ve heard him yourself, right? Well, yes and no: again, dogs do seem capable of laughter, but not in the form you would expect. “It sounds to an untrained human ear merely like the usual dog-panting,” says this time one Patricia Simonet from Sierra Nevada College, and it usually occurs – as you would expect – when the dog is at play. Oh, and “laughing” hyenas? Sorry: that “laughing” is more often an expression of frustration, when it is not being used (by means of its specific frequency and tone) to confirm the animal’s place in the pack pecking-order.